There is no greater gift you can offer your dog than to understand her: to walk a mile in her paws. Though money can buy a lot of dog biscuits and squeak toys, and those obedience classes will encourage greater responsiveness to you, a lot more is going on behind the scenes than the simple recognition of the command “Sit.” This chapter starts you on the journey discovering the mystery that is your dog. Is Your Dog a Wolf in Sheep’s Clothing? Well, yes and no. Though we go more in-depth in this part, suffice it to say that dogs approached domestication at their own speed. There was no cosmic moment when some brave young boy (or girl), holding a wolf pup, approached their father and said, “Please, Dad, can we keep it?” Domestication was a slow evolutionary process that involved the gradual progression from curious wolves that drew closer to our campfire, to the marked physical changes that characterize dogs we know today. Our relationship with dogs began during a time when survival was our only focus. Centered on staying alive, dogs provided personal protection and hunting assistance. For eons, dogs and humans evolved in parallel: During the agricultural era, we modified our selection process to produce dogs who would cull the varmint population and others who would herd livestock. As kingdoms grew, massive dog breeds were shaped by a process of manual selection to guard the castles and aid in wars. And so on and so on until today, when there are more than 400 different dog breeds that populate our globe, all developed for particular tasks. There is only one problem: Except for a few instances, any dog’s special talents are rarely needed. But don’t tell your dog: It would be too depressing. He thinks his abilities are still in high demand. To know your dog, however, still requires you to understand his original breeding, and respect that his genes are still guiding his behaviors today. In Identifying Your Dog’s Individuality, you discover how to identify your dog’s temperament and how it shapes her understanding of the world you share. For example, a dominant dog assesses everyone who enters, whereas a timid dog hides under the table when the doorbell rings. Embracing your dog’s personality helps you in your effort to orchestrate a training program to normalize your life together. Unlike people who learn by listening, your dog is much more attuned to nonverbal communication, from how you hold your body (especially in moments of tension or stress) to where you focus your eyes. Learning your dog’s language will help you understand her behavior and be understood in kind. If you consistently look at your dog, she may interpret your interest as a need for leadership. Remember this little jingle: The more you look at your dog, the less she’ll look to you. Dog’s devotion to people was hard-wired upon domestication. Your dog is the only species that will look to and take direction from another species (that’s us) as if it was their own. To really consider life from your dog’s perspective, you need a new nose. Dogs rely most heavily on their sense of smell to interpret even the minor aspects of their surroundings, such as when another animal may have passed through or even the stress hormone of a visitor in your home. There is also a big difference in dog’s hearing abilities, which can be traced to the evolution of our separate species. Humans are more sharply attuned to the sound of other human voices, whereas dogs are capable of hearing higher frequencies and fainter sounds. Because dogs evolved from hunters, their hearing is more attuned to the sounds that their potential prey might make. In today’s society, your dog’s sensory strengths are rarely appreciated. An apartment dog is admonished each time he alerts to the sound of a footstep; hounds are scolded for getting into the trash; and all breeds are reprimanded for chasing the family cat. In our world, dogs are on sensory overload yet are expected to ignore everything. In Chapter Sensory Perceptions, you can experience the world from your dog’s perspective and also find out about new tasks that are being set for dogs that take advantage of their special sensory skills. Whether you have a puppy or older dog, you can appreciate that time and experience will make a difference in your dog’s behavior. A young puppy, who is often interpreting many of life’s nuances for the first time, watches your actions carefully and is influenced by how you behave. An older dog, however, who has studied many human responses, may be less influenced by your activities — unless they’re unusual or unexpected. In Chapter Meeting the Needs of Your Growing Puppy, our puppy chapter, we highlight the way a puppy’s mind develops and the ideal lessons to introduce at every stage. Further, we stress the critical importance of early socialization and how encounters with various people and places can change your dog’s life — forever. Dogs age too quickly. Though many of their life processes mirror ours, their timeline accelerates at ten times our rate. By age 3, your dog is a mature adult, by 7 most have reached middle age, and by 10, many are heading into their twilight years. It’s a reality that can’t be ignored or avoided. In Chapter Reading and Communicating as Your Dog Ages, you can find out how your dog’s internal processes function throughout maturity and what you can do to ease their emotional adjustment. Like humans, physical changes are often accompanied by feelings of defensiveness and fear. Dogs love to learn and feel connected to group activities. How you develop as a teacher and translator directly affects their enthusiasm for learning and, in turn, for life. Think of each lesson and highlighted word as though you were teaching a foreigner your language. “Sit,” “Wait,” “Down,” and “Good” get lifted beyond mere command status, to verbal directions that show your dog how to act in everyday situations. In Part III, we lay out all the tricks of the trade, exploring learning influences and emotional responses. In addition, we help you make sense of the different schools of thought about how to teach your dog and compare the differences between them — for example, shaping versus modeling. There is no one approach to encouraging good behavior: Each dog is unique and may respond better to one technique than another. A clearly orchestrated attempt to educate yourself and understand the different methods available will keep your training effort fresh and alive. We also examine exactly how your dog assimilates new information and how you may use this understanding to further influence her behavior. Though a dog can recognize up to 165 different directions, your goals need not be so lofty. In Chapter Happy Training, Happy Tails, we outline six directions that are most useful for navigating your life together (see Table 1-1). 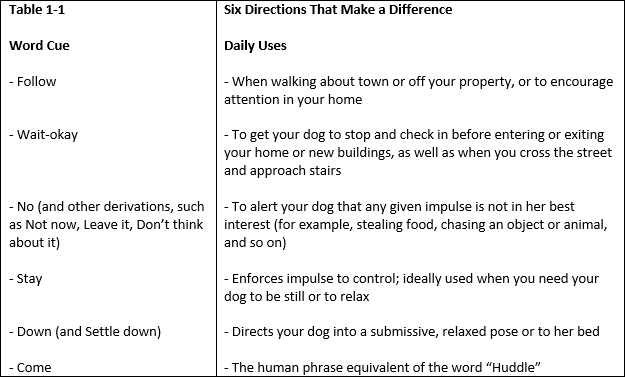 After you have these directions firmly planted in your dog’s memory bank, they form the foundation for controlling your dog’s behavior. Their use reassures your dog of her place in your family and her vital inclusion in your world. There is no greater gift you could offer your dog than that. No matter how livid you feel when your dog disobeys you or damages prized possessions, you won’t influence her routines until you sit down and listen to her side of the story. Sure, your half-eaten shoes cost $95 dollars, but to your dog, its enticing aroma (perfume YOU) was impossible to pass by. In this section, we lead you through the most common frustrations, from housebreaking to anxiety-driven behavior and on to darker issues such as aggression, in our efforts to shape your ability to respond in a manner that your dog understands. Just as people do, many dogs act out when they feel misunderstood, restless, or needy. If you walk around claiming that your dog is reacting out of spite, then, in your mind, her every reaction will be tainted by that view, even though “spite” is not an emotion dogs have. If you keep shouting “Bad dog!” every time your dog makes a wrong move, what option does she have? Dogs, like children, are motivated by what gets attention. However, it often appears that dogs can’t differentiate positive attention from negative. If an action gets a reaction — any reaction — it will get repeated. Furthermore, negative attention can be misperceived as being rough play or confrontation. Thus, a dog who steals from the counter may feel prize envy when her people react uproariously. A smart dog will simply wait until their people have left the room, and then (minus competition) carry the prize off to a more secluded space. In Chapter Addressing and Solving Problem Behavior, we examine how a dog learns to misbehave and just what can be done to reverse this trend. Though you may have a real issue with some of your dog’s behavior, it’s unlikely that she does. Though a pee-stained carpet can raise your blood pressure, from her point of view the carpet is just as absorbent as the grass, and whether her accident was motivated by need or distraction, she did what came naturally. Now, don’t get distressed. We’re not suggesting that you must live with a dog who urinates on the carpet, or jumps on company, or chews your slippers, but recognizing that your dog’s behavior isn’t motivated by spite, vengeance, or guilt can ease your frustration. Chapter Addressing and Solving Problem Behavior addresses many of the most common complaints dog owners have about living with their dog, including barking, chewing, jumping, and housesoiling. Each behavior, though disruptive and aggravating, may be a perfectly normal sign of a dog that has bonded well and is trying to get along within the family unit. Although reorganizing her outlook may require some effort and intervention, the process usually takes less time and is less stressful than coping with the current frustrations that have become status quo. Aggression is the one behavior that sets a red flag down on any playing field. Though it’s sometimes perfectly understandable, dogs are simply not allowed to bite human beings, unless of course they’ve been trained to such ends or are legitimately defending their territory. Dogs who bite are excluded from activities, relinquished to a shelter, or euthanized. Before your dog shows any signs of aggression, it is wise to understand what motivates him and do what you can to prevent it, either with your dog or other dogs you meet. Chapter Understanding and Resolving Aggressive Behavior takes a look at the different types of aggression, noting what may prompt such reactions. You also can discover what you can do to prevent aggression when it first appears. No book for home use can address the needs of a dog that is exhibiting a full-blown aggressive response and threatening the safety of family members. Although we give you the means to recognize the nature of your dog’s behavior, and even some ways to deal with it, if your dog has seriously bitten someone, or is really scaring you because he is threatening to bite, you must seek professional advice. What Are Dogs and Why Do They Behave That Way?